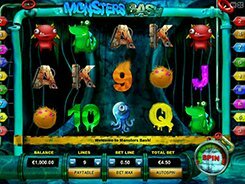 Monsters Bash is a 5-reel 9-payline video slot that features refined graphics, high-quality animations and a funny monster theme. The transparent reels are displayed against a dark basement or a sewerage system where a group of eerie monsters are having a bash. A total bet that ranges from $0.1 to $18 per spin will be suitable for low to mid rollers alike, whereas a fast-paced gameplay will take the fancy of most slot fans, no matter if a beginner or a pro. The game features a wild symbol, a scatter and a free spins round. The wild represented by a pop-eyed green monster substitutes for other icons and pays out the slot’s jackpot worth 9000 coins if five of them land on an active bet line. Besides, the wild symbol doubles a combination value where it is used as a substitute. The second feature is a scatter symbol that awards your total bet times x500 if these five land in any position. Three, four or five scatters activate 15 free spins with all wins trebled until the end of the bonus spins. PLAY FOR REAL MONEY!